On the surface, this might seem like a think piece on social media and social games. How social media has evolved and devolved to take us back to some sort of cyber grassroots state of loneliness and how we’re all just here to find a connection. In November of last year, HootSuite published an infographic on “The Evolution of Social Media.” You can check it out here: http://blog.hootsuite.com/evolution-of-social-media-infographic/. It traces 5 years of social media. 5. Granted, a lot has happened in the last 5 years. The amount of social media users is staggering. People are using social media to innovate, to change the world, to drive business, build brands and other Important Things. They’re also using it to connect to other people. When it really comes down to is, the Facebook and Twitter users that companies are trying to hook with compelling content and calls to action are people who, even though they may buy what the companies are selling, are maintaining their online community because it’s their COMMUNITY. The people they interact with are their friends, or at least they are sort of friends, and it becomes very important on a psychological and philosophical level. This isn’t news. Since AOL launched in 1985, people have used computers to connect to one another. By 1997, they could chat with each other real time. Google was born in 1998 and by 2000 the dot com bubble went kablewy and people were already wondering about the future of the Internet. That was the first year that I, personally, started using the Internet with any frequency. I know, right? Late bloomer for sure. In 2000, as Google announced that it had indexed over a billion pages, I was taking surveys on a site called emode.com. The first quiz I took was “What Type of Dog are You?” I was a Golden Retriever. So I joined Friendster. The personality quizzes gave way to testimonials written by people who knew you in real life and who had known you on the Internet long enough to say something nice about you. You posted pictures of yourself. You looked up ex boyfriends and ex friends and long lost family members. Sometimes you found them. I’d just gotten settled into Friendster when this same friend said “Hey, everyone’s moving over to MySpace.” I said I didn’t want to go over to MySpace. But those customization options were too tempting and I caved. You could post songs to your profile and change your background. You could pick who your “Top Friends” were (a pressure-filled task) and you could have your own blog. I started blogging there, almost lost a job over it in 2005, and this blog was born in its first Blogspot iteration soon after. In January 2008, based on an invitation from the same friend who lovingly dragged me into every social media platform I’ve actively participated in (you know who you are :)), I joined Facebook. Since then I have shared probably way too much information (though not nearly as much as a lot of people I know), have watched friends go through breakups and heartbreak, have gone through the same thing myself, and have, on the balance, had a pretty good time on it. Lately, Buzzfeed and Zimbio have had personality quizzes clogging up everyone’s feed. “What Game of Thrones Character Are You?” and “What Disney Princess Are You” have provided delight to some, a cause for disdain and complaint for others. But today, I saw it. “What Kind of Dog Are You?” Social media, for me, has come full circle. 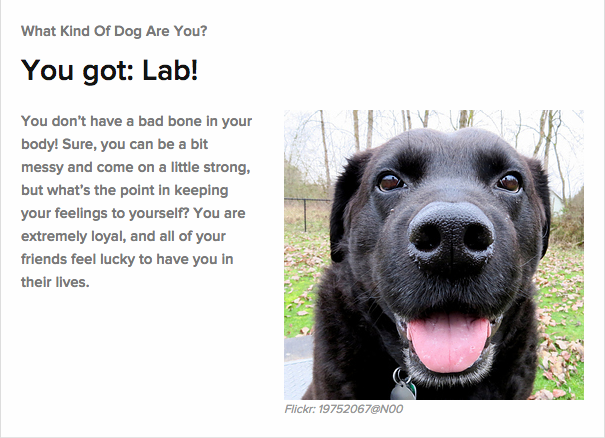 And, apparently I’m a Lab. This entry was posted in Social Media and tagged Blog, emode, Facebook, friendster, internet, myspace, Online Communities, online quizzes, Website. Bookmark the permalink.